Hi everyone! 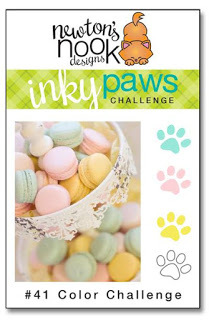 Time for another Inky Paws Challenge post! Last week, I was one of the lucky winners and my prize has already shipped! Can’t wait to get my new stamp!! Anyways, here is the color challenge from Newton’s Nook for this week. I also used the sketch from Freshly Made Sketches 276. Check it out! I really like how soft and pastel these colors are- perfect for Easter- but I do not really have any Easter stamps at all so I created this sweet sorry card. The sketch is really versatile, I can see myself making a few more cards with this layout. I started by ink blending my background with Spun Sugar and Cracked Pistachio Distress Inks. Then I Copic colored the image and fussy cut it out before popping it up on the panel. I used foam tape to adhere the slightly more narrow panel onto my card base. I’m not rally sure why I colored the ground in the image gray when its green on the panel…but oh well! Hope you like it! Have a great day! Hey guys! If you follow my blog or Instagram at all you know I love Birdie Brown and especially her gnomes. So when I saw the latest MFT Wednesday Sketch Challenge I pulled them out once again to create another card. Check it out! I started by stamping MFT’s wood plank background onto the bottom inch of my card base. Then I added a strip of paper that I colored with a Copic to make sure it matched my gnome perfectly above the wood grain. Next, I took a Fancy Scalloped Circle die from Kat Scrappiness and cut it from some black card stock. This die isn’t a frame die so I had to take a separate plain circle die to cut out the center portion to make it into a frame. I added it to my card base as well as some grass cut with a MFT border die and did some soft ink blending for the sky. Finally, I added that adorable little guy with some foam tape. Thanks for stopping by! There will be a few more cards posted today so come back!!!!!! Hey all! It’s time for another Can You Caee It? challenge! This time Kim chose the colors and they are a classic combo! Red, pink, black and silver! I love our color challenges because they always push me out of my comfort zone- I rarely ever use silver, I don’t know why because I loved using it in this card! Check it out! I started by edging my card base with a silver marker to give it a faux embossed look. Some people run the edges of cards along a Versamark ink pad then heat emboss but I like lazy ways of doing things! Then I stamped the adorable stack of penguins from Art Impressions on a super rate panel and colored them in using my Copic markers. The sentiment that comes with the penguin set is holiday themed so I created my own using Perfectly Penned from Concord & 9th. This is a very CAS card but those cuddly birds and custom sentiment make a bold statement! Hope to see you playing along over on the Facebook page! Hey everyone! I have a very different styles card for you today. I’m usually a very CAS style guy with lots of white space. But today I wanted to try something a little out of my comfort zone. I was inspired the the current color combo at the Color Throwdown challenge. I was really inspired by the stripes in the rug and the orange flowers in the inspiration photo. Here’s how it turned out! I started by painting some teal stripes onto a white panel. Then I stamped the sentiment and flowers in black ink. I added some orange Copic coloring to the image. I popped up the panel using some fun foam onto a kraft cardbase. This was a super quick card and I love how it turned out. I may be exploring this style a little more! Hi, everyone! I am back with another card to share with you! Last week I made a very colorful card, so for my project today I wanted to stick with a neutral and masculine theme. Check it out! I started by stamping the cup and saucer from Waffle Flower’s Warm Wishes randomly onto a white panel cut smaller than the kraft card base I used. Then I cut a small rectangle out of kraft paper and and white heat embossed the awesome sentiment from Simon Says Stamp. I popped up both panels using some craft foam to give it some dimension since ir is such a simple design. Thanks for checking out my 2nd post as the CLC guest designer for February! Have a great day! Hi, friends! Okay, final card for the day. This time its for the Cupcake Inspirations challenge. I really loved how pastel the colors look and wanted to create a simply soft card. I thought that since the colors were so feminine I would use some more masculine or gender neutral images for some contrast. I chose some mushrooms from Poppy Stamps. Check it out! I started by die cutting the dotted frame and stamping my images inside of the them. Then I used my Copics to color them in and popped up the panels using foam tape. I added a Mama Elephant sentiment to the top of the long panel to finish it off. Hey guys! Time for my second card of the day! This one features more MFT cuties! I used the color combo from CAS on Sunday which features white and a variety of blues. For my card I got some extra inspiration from Keeway Tsao and the card she made for Neat and Tangled. Here is my version. I started by doing some light ink bending onto my card base with Mermaid Lagoon and Cracked Pistachio. Then I added a strip of Lawn Fawn paper and stamped my sentiment in the same Distress Ink colors. Finally, I added the Cool Cat and Pure Innocence girl that I die cut and Copic colored.